Michael Wolniewicz (wool-nev-itch), has over 30 years experience designing and managing projects that span the world, and over the years, he has worked with clients such as Time Warner Communications, AOL, the World Zionist Organization, CBS, the Dubai International Airport and the Beijing Olympics. His furniture has been featured in articles in Home and Design Magazine and Washington Spaces. 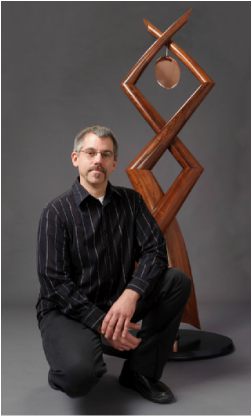 Michael received a BA in Furniture Design at Buffalo State University in 1989 with a minor in pottery. After college he worked for several mill companies in upstate NY and also became skilled at antique furniture restoration while exploring his own design voice. Early on he was inspired by the works of Roycroft, Nakashima, Frank Lloyd Wright and Sam Maloof. He began to explore the designs of Greene and Greene when he moved to Virginia and working for Hardwood Artisans in Woodbridge. While there, he designed and built custom arts and crafts furniture, custom hardware used for the Urban Line and worked on developing the Waterfall Line. It was during this time that he really began to develop his artistic voice and decided to go into business for himself. Michael works mainly from his studio in Chester Gap, Virginia, nestled in the woods on the backside of the Shenandoah National Forest. The studio is a modest two story structure. The first floor is the woodworking studio, and the second floor is home to his pottery studio which he shares with his wife, Catherine, a painter and tile artist. Their studios have the distinction of being part of the Artisans of Virginia Rappahannock County Artisan trail network and part of the Annual Artists of Rappahannock County Open Studio Tour which happens every November. Over the years, Mike has been fortunate to be exposed to working with mediums other than wood, and is never shy when it comes to trying something new. Michael dabbles in stained glass design, tile work, pottery and his latest passion, copper and metal work. On larger complicated works, such as a replication of the Arch du Triomph, he has elicited other craftsman such as calligraphers, sculptors and metal workers to add to the pieces. Many of his resources come from Old Town Woodworking in Warrenton VA. He collaborates with his wife on many design projects and finds that being with other artisans and artists enriches his own work in ways that are often delightfully unexpected.